A rare pair of 19th century silver fish servers are on offer from Schredds at next month’s Petersfield Antiques Fair. Made in 1822 by William Chawner II of London, they feature agate handles and are thought to be unique. Finding such servers as a pair is unusual. They are priced at £2200. Each is engraved with a crest of five ears of wheat, suggesting that this was a special commission. Silver specialist Schredds is among 39 dealers exhibiting at the Hampshire event, organised by Penman Antiques Fairs and running from February 1-3. Porcelain, jewellery, furniture and fine art are also on offer. Among the first-time exhibitors is van Halm & van Halm, a specialist in oriental ceramics. 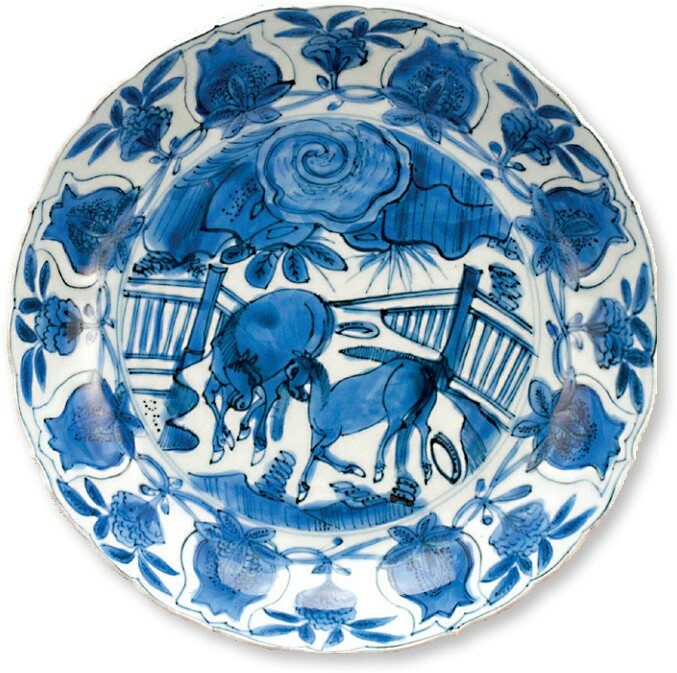 It brings a blue and white Kraak porcelain plate decorated with a scene of horses in a garden. The border features moulded and painted pomegranates interlocked with flowers. Made during the Wanli period (1573-1619), it is offered for £2400. The Petersfield fair has run for more than 40 years and is fully vetted with no datelines.